As the name suggests, Bad Breath is an unpleasant odor arising from the mouth that can be done away with the help of a number of conventional as well as natural home remedies for Bad Breath like cardamom, cinnamon, mint leaves etc. The presence of decaying food particles and bacteria usually lead to embarrassing Bad Breath. This condition may also be caused by certain medical conditions. But, more often than not, foods like cheese, garlic, onion, and other pungent foods cause Bad Breath commonly. Dry mouth may also be held responsible for causing chronic Bad Breath. The condition is also called Halitosis in medical terms. Poor oral hygiene is one of the most common causes leading to Bad Breath. Consequently, natural treatments for Bad Breath usually emphasize on maintaining proper oral hygiene by brushing and flossing the teeth twice a day. Besides, consumption of foods strong and pungent foods and acidic beverages like tea, coffee, alcohol, soda etc tend to increase unpleasant odor arising from the mouth. The habits of cigarette smoking and tobacco abuse have also been known to cause Bad Breath. Many individuals often face the problem of early morning Bad Breath. This happens because of dry mouth caused by decreased production of saliva during the night. Apart from this, certain medical conditions like Liver Diseases, Lung Diseases (for instance, Bronchitis), Gastrointestinal Disorders, Lactose Intolerance, Periodontal Diseases, Diabetes, Sinusitis, Blood Disorders and other related diseases may also result in the same. Factors like stress, breathing through the mouth, speaking a lot, or intake of medicines such as antidepressants, blood pressure medicines, diuretics and other such medicines may also contribute in causing dry mouth. At times, food particles tend to accumulate in certain areas of the mouth due to the use of dentures or braces that make it hard to clean the areas around them. 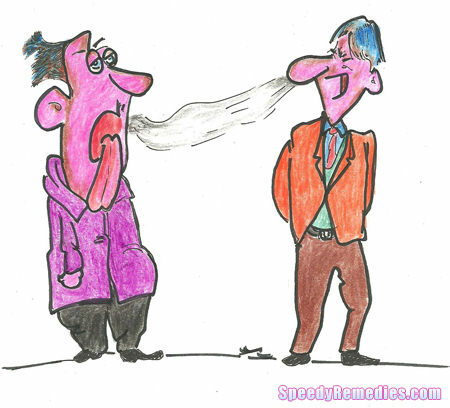 The presence of a foul odor is the most obvious symptom of Bad Breath. A popular way to identify this problem is to breath in your own hands. Although, this method is not very reliable as it does not include the odor originating from the back of the mouth. Bad Breath may also be accompanied by a bad taste in the mouth. • Herbs like spearmint, parsley, rosemary etc are excellent natural home remedies for Bad Breath as they tend to refresh the breath. • Gargling with a cup of water mixed with some baking soda is a widely used natural remedy for Bad Breath. Using Hydrogen peroxide (3%) is also considered beneficial in this regard. • Chewing fresh guava fruits or its tender leaves is a tried and tested Bad Breath cure. Chewing leaves of holy basil also serves as an efficient home remdy. • Crunchy foods like apples, avocados, carrots, celery and other such foods are widely used natural home remedies for Bad Breath. Chewing these foods helps stimulate the production of saliva that prevents dry mouth. • Another effective home treatment for Bad Breath is the consumption of fenugreek tea. It can be prepared by simmering one teaspoon of fenugreek seeds in half a liter of water and then straining the mixture. • Mouthwashes containing natural essential oils like peppermint oil and tea tree oil are highly beneficial in healing this problem at home. • Rinse the mouth regularly with lemon juice mixed in water in order to avoid Bad Breath. This mixture can also be used in combination with ginger juice for this purpose. • Consumption of natural pineapple juice is regarded as a good natural cure for Bad Breath, especially the one resulting from garlic. • Cardamom, cinnamon, cloves and fennel seeds serve as effective Bad Breath home remedies, especially when taken after meals. • Brushing the teeth with the help of neem twigs (margosa) is one of the Bad Breath home remedies. A healthy diet consisting of citrus fruits and green vegetables is considered beneficial when dealing with Bad Breath. Oranges, lemons, and juices extracted from fresh green vegetables help to reduce this problem in a natural way. Moreover, intake of probiotic foods like yogurt is a highly recommended Bad Breath home remedy. Hazelnuts are also beneficial in this regard. Plus, drink plenty of water throughout the day at regular intervals in order to prevent Bad Breath caused by dry mouth. Besides, consumption of green tea and black tea is useful in inhibiting the growth of bacteria. Apart from these remedial measures, certain preventive measures like avoiding meat products, sugary products, and other acidic beverages also help to avoid Bad Breath to a great extent. When it comes to bad breath related to gastrointestinal disorders, i think the hyatal hernia tops the list.